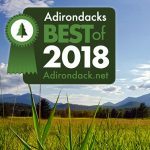 Garnet Hill is a fantastic location for Adirondack canoeing and kayaking. Perfect for paddling, Thirteenth Lake is a beautiful, tranquil lake, with gorgeous mountain views that measures two miles long and 1/2 mile wide. It is and fed by numerous brooks and streams from the surrounding hills and mountains. The lake’s outlet is Thirteenth Lake Brook which meanders a steep and winding path down to the Hudson River in North River. For those who are interested in fishing, every spring the DEC stocks the lake with a variety of fish: freshwater salmon, lake trout and brown trout. 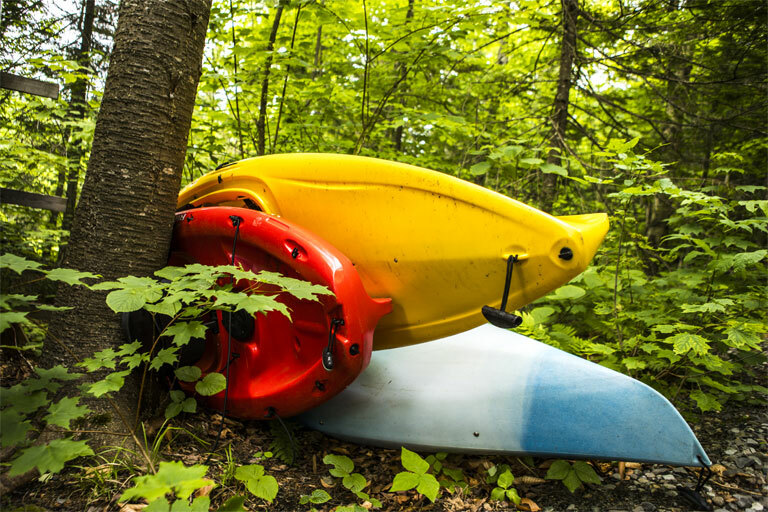 Garnet Hill Lodge maintains a fleet of 14 canoes and kayaks for the use of our guests, along with paddles and life jackets. During midday hours, approximately 11 am to 6 pm, we have a beach attendant on duty to help you put-in and take-out your boat, getting it from the boat rack to the lake and back. The boats themselves are available to you from dawn to dusk merely by signing them out at the front desk. Go canoeing or kayaking with one of the boats in our fleet an explore the many quiet and interesting spots along Thirteenth Lake’s pristine and totally uninhabited shores. You can choose from our fleet of one or two person canoes and kayaks. Loons and beavers are regular inhabitants of the lake as are osprey, eagles and hawks. Garnet Hill also offers the unique opportunity to paddle across the lake to hiking trails that lead up to Peaked Mountain, or Hour Pond and Bull Head Mountain. These treks make excellent day-long adventures and you can purchase a packed lunch from the lodge to take along with you. Discover canoeing and kayaking in the Adirondacks. Make plans to visit us today!